A chalazion is the medical term for a slowly developing lump on the eyelid that occurs due to an oil gland blockage. At first, the eyelid may appear to be red, tender and swollen. After several days, the chalazion will form on the eyelid, appearing as a slow growing lump. While it is initially painless and nearly impossible to detect, with steady growth, the chalazion may reach the size of pea. Chalazia are most common in adults between the ages of 30 to 50, although individuals of all ages, including children, can develop a chalazion. Initially, chalazia can be difficult to diagnose as they are often confused with styes. 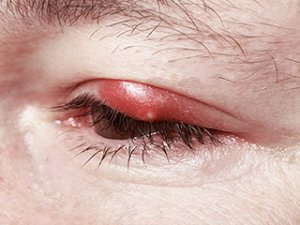 A stye is also a red, swollen lump along the eyelid. However, styes are located on the edge of the eyelid or inside the eyelid’s immediate surface. They are more painful than a chalazion and typically occur closer to the eyelid’s surface. A stye is caused by an infection of the oil gland within the eyelid; a chalazion, in contrast, is caused by a blockage in the actual oil gland. Glands within the eyelids known as the meibomian glands naturally produce oil. Should a blockage within these glands occur, oil will build up inside the gland and eventually thicken, forming a lump known as a chalazion. In some cases, the gland may even break open, releasing the oil into the surrounding eyelid tissue, which causes inflammation. In some cases having a stye can also result in a chalazion. Risk factors for chalazion development include conditions associated with excessive oil production, such as seborrhea and acne rosacea. A viral infection, tuberculosis, and chronic blepharitis (inflammation of the eyelids and lashes) also increase the risk for developing a chalazion. In some cases, a chalazion will resolve itself over the course of several weeks without the need for medical intervention. At-home remedies can speed the healing process. For example, an eye care provider may recommend the application of a warm compress to the eyelid for 10 to 15 minutes four to six times per day. Warmth from the compress can help soften the hardened oil that is blocking the gland, facilitating the healing process. Light massage on the external area of the eyelid may also help to facilitate drainage. Never attempt to squeeze or drain a chalazion by yourself. If the chalazion does not heal within one month, contact your eye doctor for additional medical care.